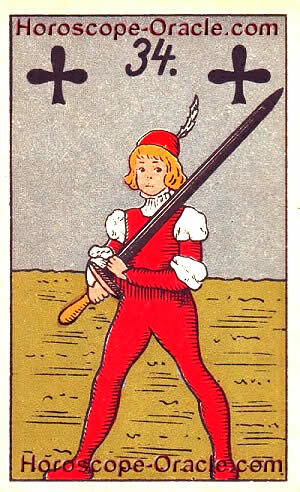 The result we combined with the right Lenormand Tarot card, the sword. Today you will already feel that a threat is coming to you. It will look like a big problem, but then somebody, who you never expected, will help you. Maybe you will find new good friends at the end of the day. The sword is also standing for justice. This card advises you, to make everything in your working place in a correct way. If you are the owner of the company you must take care, because soon a lawyer will get in contact with you. If you did nothing wrong then the situation will finish soon, with a good end for you. Today you will become familiar with with a strong, handsome man. He will impress you, because he is smart, too. This man can help you, if you tell him about a problem of you. You will be delighted of him! Take time to start a relationship with him, do not be too spontaneous. The Tarot card the Sword warns you for an imminent danger which will come to you and with will have a happy ending for you. Somebody unexpected will come to help you with a problem.